Smugglers’ Notch Resort offers many different kinds of amusements, from swimming to skating to sliding, but the main focus of our three-day visit in January was certainly skiing. 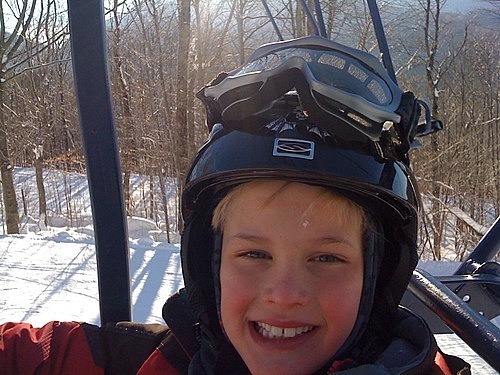 Both Tommy and Teddy were signed up for daylong skiing camps each day and it was my hope that they would not only have fun and get some great runs in (the snow was fantastic) but also gain confidence and skills. I wasn’t disappointed. 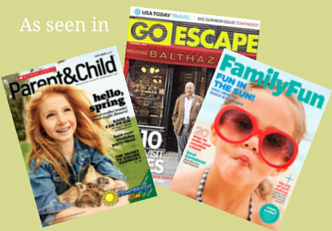 I can give you a list of some very specific reasons why Smuggs is a great place to take your children (or yourself for that matter). 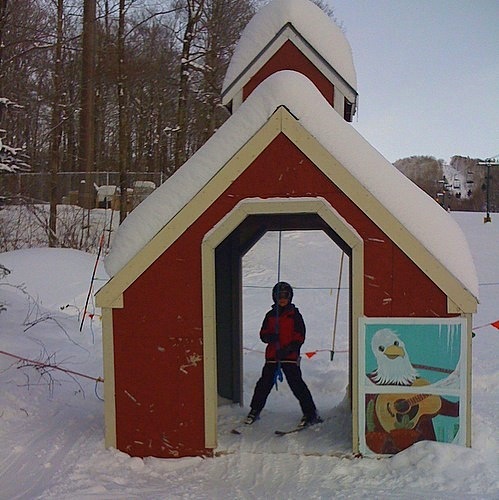 It’s my hope that in addition to giving an overview of what makes the Smuggs programs so good is that they also offer a kind of map for anyone who is thinking about enrolling their children in a ski or snowboard lesson program. Ideally you have some choices about where to go and it’s my hope that this list helps you identify what questions to ask when selecting a ski area. 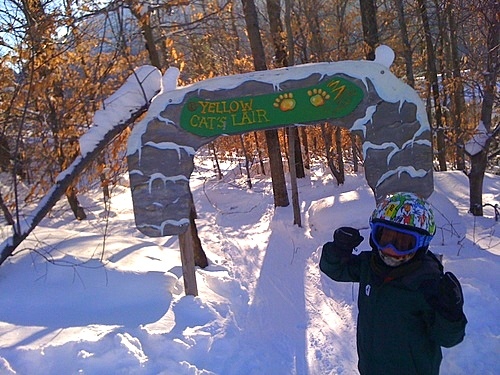 So what makes Smuggs a great place to have your children learn to ski? Smuggs has three mountains: Madonna, Sterling, and Morse. The trails on Morse are flatter, shorter, and well-groomed (there’s also a beginner terrain park there that won Tommy’s heart). That means children who are learning can feel comfortable and safe. At the bottom is a learning park with a carpet lift and some very small hills. It’s really nice that there is terrain designed for everyone, even the most intimidated beginners. And I loved that I didn’t have to worry about more advanced skiers and boarders tearing down the trails around my children while they were trying to learn. 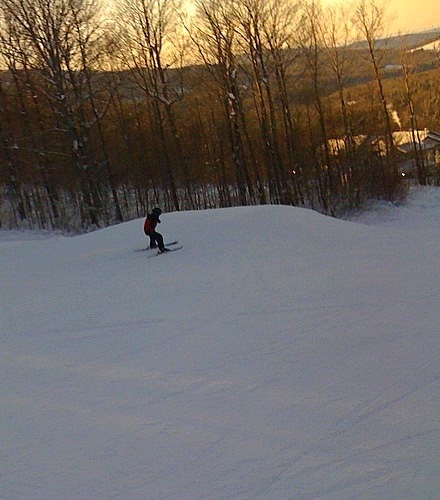 I also loved that I could take off and ski the bumpier, steeper, and longer trails on Madonna and Sterling. Children are grouped by age, but also by ability. 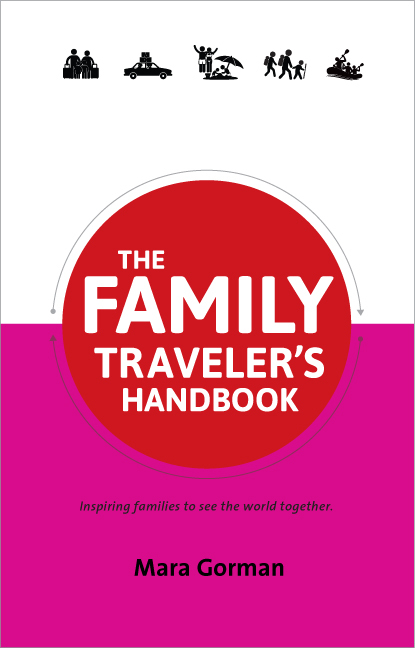 Having nine levels to choose from means that the kids are grouped with other children who are at a similar level. And the instructors pay close attention to where the children belong so that adjustments can be made from day to day. 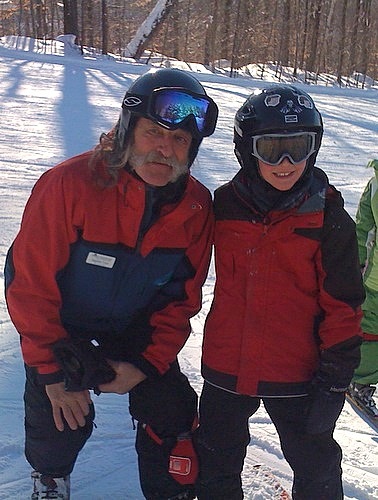 Smuggs has really put some time into thinking about what will make skiing fun for kids. Younger children start the day indoors with toys to play with, which means no waiting around in the cold until their entire group has assembled. 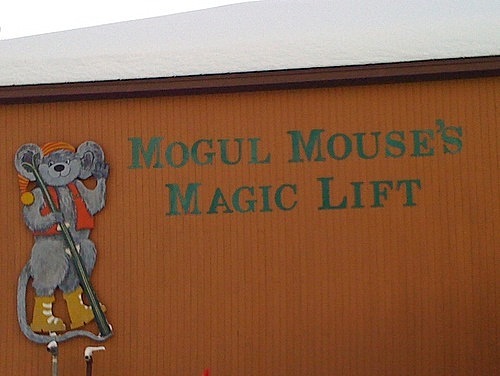 When they go outside and are ready to ride up the mountain, they do so on Mogul Mouse’s Magic Lift, the towers of which are decorated with painted cutouts of different characters offering safety reminders. 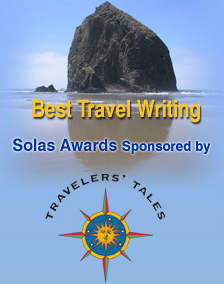 to scooting through King Billy Bob’s Den. Smuggs has even thought of the Future Skiers of America. There’s a little rope tow on a flat patch of ground in front of the child care center so that children who have just learned to walk can try on equipment and see what it feels like to move on skis. Everyone we interacted with was positive, patient, and encouraging. From the moment we signed in, I felt completely confident that that the staff would do a great job of taking care of my children. Both the boys loved their instructors, and the results of their teaching abilities were demonstrated in the strides they made in their skiing. Another cool touch for kids and parents is the use of a GPS system that lets you check online at the end of the day to see how many feet and trails the kids skied, although I’ll admit that we were all so tired each evening by the time we got back to our condo that none of us thought to look! The kids take plenty of breaks and no one has to stay out skiing if they don’t want to. There are always adults in the indoor meeting area to watch children who decide to stay inside. In the all-day programs, the kids ski until the middle of the afternoon (2:30 or 3:00) but the resort then offers different programming every day so that parents can continue to ski until lifts close if they aren’t ready to call it quits. Some days there’s a movie, on others there’s a singing pirate or a magician. My children mostly wanted to ski with me and Matt after their lessons were finished, but we did catch part of the Science Show with The Winter Wizard and Professor Pinhead on Saturday, and it was funny and educational. Tommy was already an enthusiastic beginning skier when we arrived at Smuggs and his skills (and speed and desire to go over as many jumps as possible) only improved during the three days he took day-long lessons. 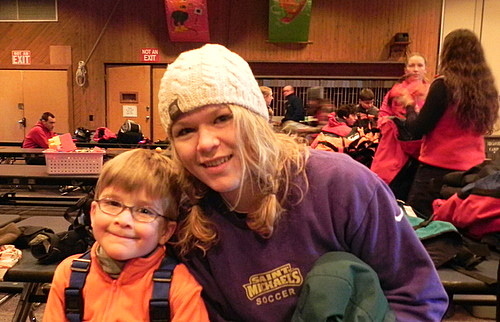 He loved his teachers, enjoyed the fact that lunch was served cafeteria style so he could choose his own food and have a little of everything, and got along well with the other kids in his group. He and I shut down the lifts on our last day there, and let me tell you, I was skiing at full speed to keep up with him. Teddy has always been another story. Never one to enjoy the cold as much as his brother, we had struggled last season and over the Christmas holiday to help him learn to like skiing and to make a more serious effort to actually do it. When we dropped him off on his first day at Smuggs, he seemed much more interested in playing with blocks and hanging out indoors in the large ski school meeting area, as per usual. But by the third day (which, I should add, was gorgeous but frigid) he insisted that Matt pick him up after the program and ski with him so he could show off his stuff. And to our amazement, not only did he zip down the mountain; at one point he got ahead of Matt and ended up hopping on the lift all by himself as if he’d been doing it every day of his life! With much yelling, Matt managed to communicate that he was absolutely to wait at the top until Daddy caught up. Later in the week when we left Smuggs and skied at Mad River Glen, Teddy delighted in trying harder trails than he had ever been willing to contemplate before and he now has confidence and enthusiasm to match everyone else in our family. 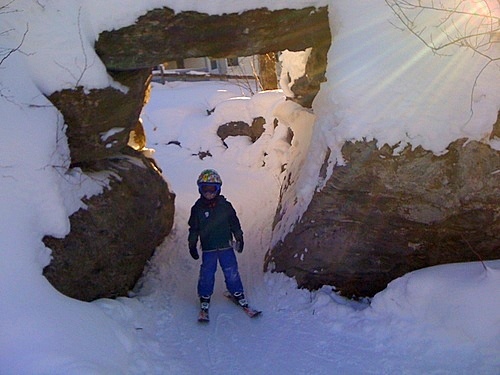 Smuggs is a resort that offers lots to do besides skiing, but I have to say that one of the things that pleased me the most was its beauty, varied terrain, and the fact that they turned my youngest child into a bona-fide skier. My only concern now is keeping up! 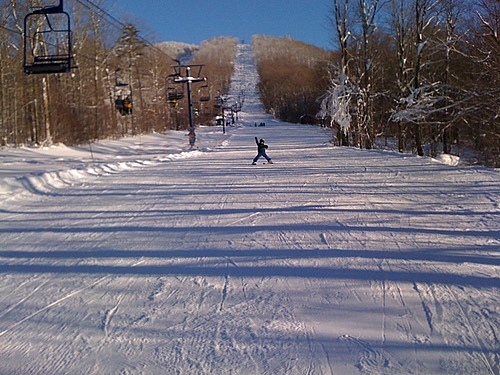 Many thanks to Smugglers’ Notch for providing accommodations, lessons, lift tickets, and lessons to me and my family. I’m sold. Looks like a great place for a family ski trip! 12 hours ago by motherofalltrips Window, Mystic.